On Monday Canada’s Prime Minister visited President Trump in Washington. Many Canadians, especially media, watched nervously wondering what would come of the visit. The answer was not much, the sun still came up in Canada and the visit was fairly uneventful and it also included a round table about women executives and entrepreneurs. It seemed more like an attempt for Trump to try and cash in on some of Trudeau’s feminist political capital (not likely to work) and a staged event to have Trudeau feel like he’s making some positive contribution. The media analyzed every detail of the visit including whether Trudeau could handle Trump’s handshake (really?) and then there was the way over-drawn discussion of what Trump meant when he said he would be “tweaking” NAFTA when it came to Canada. The phrase was clearly meant to convey that the US is NOT concerned about its arrangement with Canada. How could it be? Three states that backed Trump in the election greatly depend on Canadian trade for jobs: Michigan, Wisconsin, and Pennsylvania. Instead of relaxing a bit, Canadians immediately began the anxiety parade about what “tweaking” will mean. Washington has its own issues right now, and Canadian trade isn’t that high up, or even on the list. The Press Secretary even called Justin Trudeau “Joe” on Tuesday, a pretty good indication of how little this visit and Canada ranks on their radar. There’s a good reason for this and that’s because of Michael Flynn. Trump’s National Security Advisor Michael Flynn resigned Tuesday because, as Spicer put it, the President had an “eroding level of trust” for him and asked for his resignation. It wasn’t just Trump, Trump just couldn’t put it off any longer. The issue leads back to Russia. 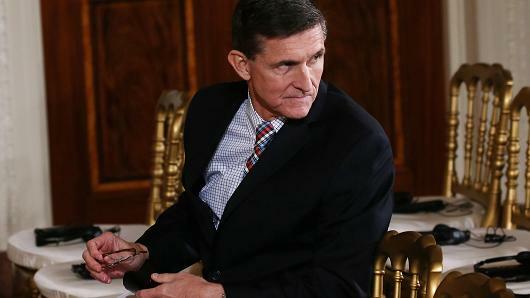 During the presidential transition in December, and just as Obama announced sanctions against Russia for its hacking during the election, Flynn was on the phone with the Russian ambassador promising an end to these sanctions when Trump took over and he lied about the contents of the call to VP Pence. It would be one thing if this was the only issue but the transition, as has become blatantly obvious, has been a mess and marred with infighting. For a man who seems to care so much about his brand, Trump seems content to surround himself with people who are intent on destroying it to implement their agenda, Banning being the other advisor that is contributing to this and helping erode whatever is left of Trump’s reputation. He’s even part of a side group operating away from the input of the National Security Council. Does Trump really think this will be a good idea? Trump need only look at retailers who want nothing to do with the name to see how this whole “being President thing” has completely sunk his reputation, both because of his doing but also because of who he has surrounded himself with. It begs the question if things would be or could be better for him if he would only ditch the most controversial, and baggage laden figures in his entourage. But the other side of this that we also have to consider is: are White House staff scrambling to implement a Trump agenda that is poorly defined, made up on the spot, frequently changing and they’re crashing and burning in the process? Leakers seem to suggest this is also a factor in the chaos. Things seem to be going from bad to worse. The nightmare is far from over for him because apparently Trump knew for weeks about Flynn’s lie. This wasn’t Flynn’s first brush with Russia. He had also dined with Putin, had paid public speaking engagements, and had connected with Russia during the election. Those close to Flynn also believe they saw a change in his views on Russia, Iran and Islam when he became connected with Trump. Was he acting on his own with this phone call about sanctions? Some media, like Politico, are suggesting that may not have been the case. There are now calls for a congressional committee to investigate the ties Trump’s administration has to Russia. This is serious, serious stuff affecting the highest branch of the US government. It comes on the heels of Russia possibly having embarrassing material on Trump, the hacking during the campaign, and the resignation of Paul Manafort last year who was Trump’s campaign chairman. He resigned also because of ties to Russia. The intelligence community needs to know definitively what is going on with this administration and Russia because otherwise it will mean an intelligence failure of the highest magnitude if Russia has penetrated the highest office in the US a la Manchurian candidate. Think about that. Really think about it. They have to get to the bottom of this and if a congressional committee has to be called to help with it, so be it. Even from Trump’s perspective, if there is nothing else to uncover, this should be something he should support. You can’t go forward in the presidency with this scandal hanging over the White House, every decision will be overshadowed by it going forward. Russia has also just test fired a new cruise missile, a violation of a historic 1987 treaty with the US that bans intermediate land-based missiles. It’s a clear provocation, and a test not just of a missile but of Trump. Russia is claiming all this talk of investigating Russian connections in the Whit House is just anti-Russian sentiment and a witch hunt. That isn’t surprising – near the end, Kim Philby said something similar.